← WHAT IF SHE HAS LEG CANCER?! SHE PROBABLY HAS LEG CANCER. Duck Norris is not impressed. Duck Norris is not impressed. He just found out, here in Australia, our Prime Minister got kicked out of office and taken over by someone else last week. He said no-one told him you could do it like that, if he had known he would have done it ages ago because kicking is his specialty. He said he was told you have to run for parliament and he’s been training everyday, getting the girls to time him while he does laps around the yard, so he’ll be the fastest on Election Day. I told him it’s not an actual race. He didn’t believe me, he’s asked for spoons so they can practice the egg and spoon race. He followed me around while I watered the garden, yelling that since I won’t give him internet access I could at least have the decency to let him know when something important is happening in his career field. He said having to hear it from the pigeons days later makes him look unprofessional. After I ignored him for a while, he shouted “Don’t worry about it! I’ll have my secretary contact your secretary” I told him I didn’t have a secretary and neither did he. He said that’s only because he’s still sorting through the mountains of applications, because it’s a highly sought after job. I asked the chickens, no-ones applied. The job ad is still up in the chicken coop. No-one is going to apply. I don’t even want to know what the salary package is. Looks like I was wrong. 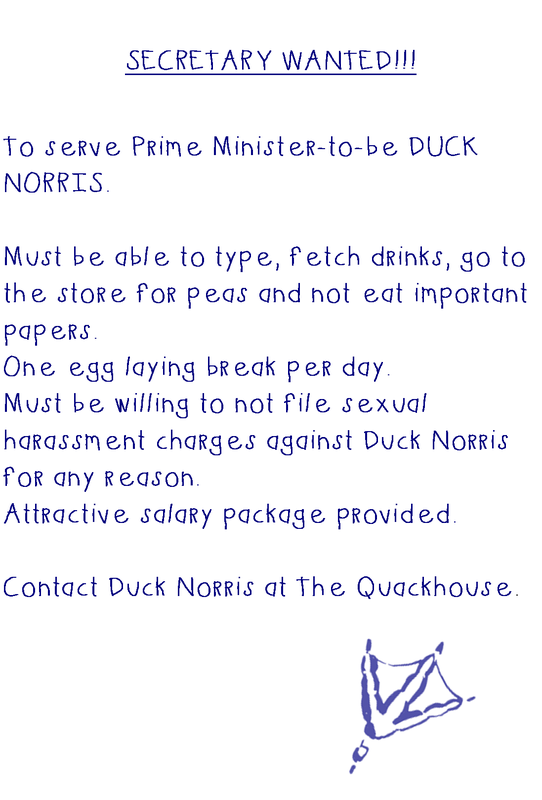 I’d suspect the demise of Tony Abbott was Duck Norris’s doing. I wonder who he’ll get as his secretary. Not eating important papers is a pretty tough requirement to set. I’m actually starting to suspect something rather scary….I think that maybe….I’m his secretary and no-one is telling me. I knew those chickens weren’t meeting my eyes when I asked them about the job position! They just quietly book-booked about with their heads down….I should have known! Well, if you catch yourself spreading marmite on important papers, you’ll know for sure.